Be a part of an exciting established mixed-use area which welcomes people, businesses and arts. Great access without interstate pricing! 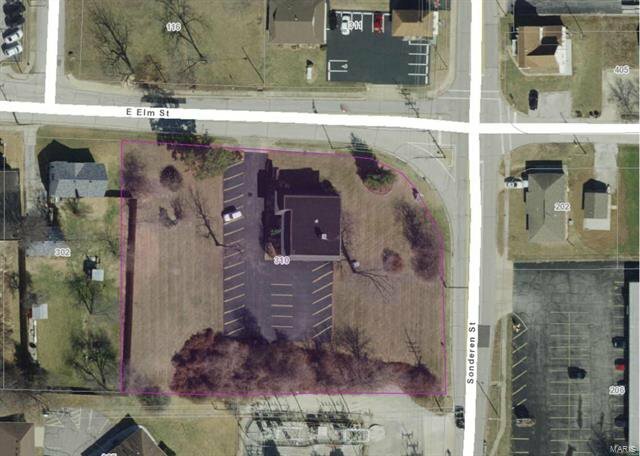 Located on the SW corner of E Elm and Sonderen, access to the site serves as a relief street for Main St., O’Fallon, & brings clients from the south side of I-70. Lot has 270’ frontage on E Elm, and 220’ Frontage on Sonderen. The 1.27 ac leaves room for growth or additional parking needs. As a prior dental office the building has 2 approx. 2000 SF individually served levels. Come March 2019 the “Downtown Overlay District” will permit flexibility in building codes. The City of O’Fallon is excited to see the revitalization of this area.